– When Canelo Alvarez faced Floyd Mayweather in September 2013, he was just 22 years old. Canelo was 42-0-1 with 30 knockouts when they met. But until then, just one win came against an elite-level fighter. Canelo’s 12-round win over Austin Trout five months earlier still rates as one of his best, but that was a close fight. So very clearly we know this rematch will never happen. But let’s look at the fight from a mythical matchup perspective. Since losing to Mayweather, Canelo has gone 8-0-1. He beat Erislandy Lara in a fight many thought he would lose. He increased his star power in a PPV win over Miguel Cotto. Most recently, he beat Gennady Golovkin in September after earning a controversial draw the previous year. Whatever your thoughts about who won, Canelo went toe-to-toe with boxing’s bogeyman, and there was little to separate the two. In the second fight, Canelo walked down Golovkin to everyone’s surprise. “If these two were to meet in the ring again at any weight in 2019, you can expect a record-breaking handle on the fight,” Oddessa told Sporting News. “The odds on the fight would be significantly different this time around as Alvarez has become a much more experienced and complete fighter almost five years later." Nobody expects Mayweather to climb out of an on-again, off-again retirement for a 160-pound fight against Canelo. Mayweather turns 42 in February and is being offered lucrative fights that are far lower risk. He’s a perfectly round 50-0. He could fight Khabib Nurmagomedov in another circus-level boxing vs. MMA fight. Canelo is right — he is a much more complete fighter. The version of Canelo that fought Mayweather would likely have been soundly defeated by Golovkin around that time. Now, he’s in his physical prime at 28 years of age. Mayweather has fought just once since beating Andre Berto in his farewell fight in 2015 — and that was against Conor McGregor in a ridiculous bout that sold the second most pay-per-views all-time. It’s impossible to use that fight as a measuring stick for where Mayweather’s skills were as a 40-year-old fighter at the time. He carried the MMA star for the first handful of rounds, giving the false sense of competitiveness before making McGregor look silly en route to a 10th-round TKO. Miguel Cotto is the heaviest opponent Mayweather has ever faced, when the Puerto Rican star weighed 154 pounds for their May 2012 bout. Cotto had moments in that fight where he was able to physically impose himself on Mayweather — and Cotto is a guy who won his first title at 140 pounds. Though Canelo will never get an opportunity to avenge his only defeat, he doesn’t have to. There’s enough business against true 160 pounders that he’ll be able to cement his legacy without invoking Floyd’s name. Clearing out the middleweight division as it currently stands could help put him amongst the best Mexican fighters of all-time. There’s still a lot of gas in that tank. 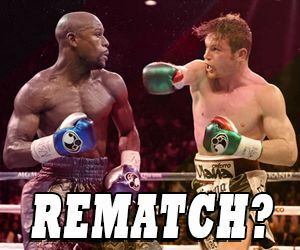 | Title: What if Canelo Alvarez and Floyd Mayweather Jr. had a rematch at 160 pounds?.